(BOSTON) — Often referred to as the “body clock”, circadian rhythm controls what time of day people are most alert, hungry, tired or physically primed due to a complex biological process that is not unique to humans. Circadian rhythms, which oscillate over a roughly 24-hour cycle in adaptation to the Earth’s rotation, have been observed in most of the planet’s plants, animals, fungi and cyanobacteria, and are responsible for regulating many aspects of organisms’ physiological, behavioral and metabolic functions. 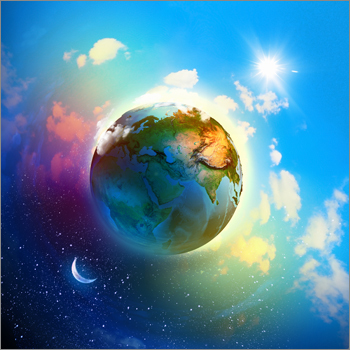 Circadian rhythm, an adaptation to the Earth’s rotation and day-night cycle, is found in plants, animals, fungi and cyanobacteria. Now, Wyss Core Faculty member Pamela Silver has transplanted a circadian rhythm from cyanobacteria into E. coli, a naturally non-circadian species. Credit: Sergey Nivens/Shutterstock.com. Now, scientists led by the pioneering Harvard synthetic biologist Pamela Silver, Ph.D., have harnessed the circadian mechanism found in cyanobacteria to transplant the circadian wiring into a common species of bacteria that is naturally non_circadian. The novel work, which for the first time demonstrates the transplant of a circadian rhythm, is reported in a new study in Science Advances. “By looking at systems in nature as modular, we think like engineers to manipulate and use biological circuits in a predictable, programmable way,” said Silver, who is a Core Faculty member at the Wyss Institute for Biologically Inspired Engineering at Harvard University and a Professor in the Department of Systems Biology at Harvard Medical School. Silver’s team used this methodology to successfully transplant a circadian rhythm into the bacterial species E. coli, which is widely used as a “workhorse” cell species by biologists due to how well it is understood and the ease in which E. coli can be genetically altered. The genetically engineered circadian E. coli designed by Silver could one day be used in probiotic pills as a way to monitor the gut microbiota, which is the collective and diverse set of bacterial species that flourish in the human gastrointestinal tract and contribute to many different health factors. 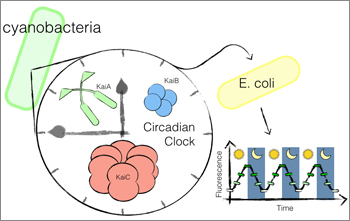 To create a circadian rhythm in E. coli, the protein circuit responsible for regulating circadian oscillations was modularly removed from cyanobacteria, a photosynthetic bacteria species that is the only bacteria known to naturally contain a circadian rhythm. The protein circuit was then transplanted into E. coli, where it can be connected to additional gene expression components to potentially influence metabolic and behavioral functions in programmable relation to the day_night cycle. In the experimental E. coli, the circuit was linked to fluorescent proteins that lit up each time the circadian oscillations were triggered, causing the E. coli to glow rhythmically in a stunning visual confirmation of the transplant’s success. “The ultimate dream application would be to deliver these circadian E. coli to an individual in pill form, which could allow the circadian rhythm to be linked to additional biological circuits in order to perform a precisely-timed release of drugs, or to be able to sense and influence the host’s circadian rhythm,” said the study’s first author, Anna Chen, a systems biology graduate student at the Wyss Institute and Harvard Medical School. The human circadian rhythm has been shown to impact metabolism, which when disturbed can contribute to obesity and glucose intolerance. What’s more, many drugs including those commonly used to treat various cancers have been shown to fluctuate in their efficacy based on the time of day and the point in a patient’s circadian cycle in which they are administered. Using circadian E. coli, therapeutic strategies to influence a patient’s circadian rhythm or to program drugs to release internally at a specific point in the patient’s circadian rhythm could therefore energize treatments for cancer and metabolic diseases, among other clinical applications. And further down the road, even the condition known as “jet lag”, which is caused when high_speed air travel disrupts a person’s body clock, might someday be combated using circadian E. coli that could potentially be leveraged to re_program and adjust the body’s circadian rhythm to match the travel destination’s day-night cycle. “What’s really amazing is that we’ve demonstrated the modularity of biological systems – this finding goes beyond the transplantability of a circadian rhythm to open new doors to understanding how other modular biological circuits could be transplanted from one species to another,” said Silver. “Circadian rhythm has an enormous impact on our health and how we respond to our environment – so the opportunity to tap into those controls, using genome engineering to rewire genetic circuits, opens an exciting new path for treating disease and regulating a wide range of physiological behaviors,” said Wyss Institute Founding Director Donald Ingber, M.D., Ph.D., who is also the Judah Folkman Professor of Vascular Biology at Harvard Medical School and Boston Children’s Hospital and Professor of Bioengineering at the Harvard John A. Paulson School of Engineering and Applied Sciences. The first successful transplant of a circadian rhythm into a naturally non–circadian species could lead to precisely timed release of drugs and other innovative therapeutic applications. In this video, gut bacteria (E. coli) exhibit a circadian rhythm after circadian oscillators were transferred from cyanobacteria. The “mother cell” at the top blinks on and off with a 24 hour cycle, visualized through the use of a fluorescent protein marker. Harvard Medical School (http://hms.harvard.edu) has more than 7,500 full_time faculty working in 11 academic departments located at the School’s Boston campus or in one of 47 hospital_based clinical departments at 16 Harvard-affiliated teaching hospitals and research institutes. Those affiliates include Beth Israel Deaconess Medical Center, Brigham and Women’s Hospital, Cambridge Health Alliance, Boston Children’s Hospital, Dana-Farber Cancer Institute, Harvard Pilgrim Health Care, Hebrew Senior Life, Joslin Diabetes Center, Judge Baker Children’s Center, Massachusetts Eye and Ear Infirmary, Massachusetts General Hospital, McLean Hospital, Mount Auburn Hospital, Schepens Eye Research Institute, Spaulding Rehabilitation Hospital and VA Boston Healthcare System.